Edwin Langhart (1915-1979) was the father of preservation of Healdsburg’s history. The City’s archival collection and written history was begun in the 1920s by Julius Myron Alexander (1880-1930), a nephew of early settler Cyrus Alexander. Ed Langhart who served as City Clerk, Administrator, and Manager from 1948 to 1974 took custody of this collection, becoming the town’s unofficial historian. 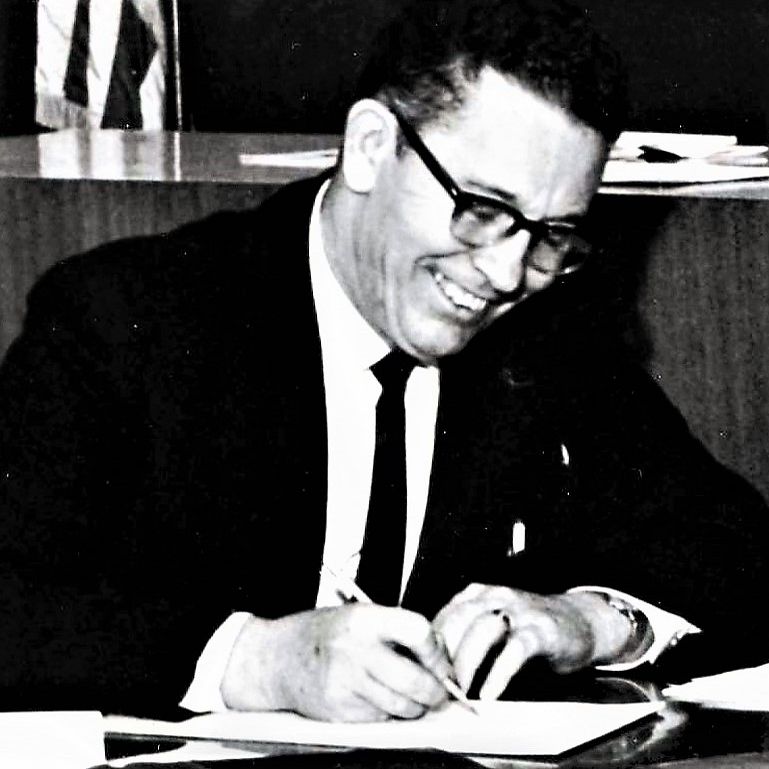 During his tenure, inventories of the city archives were done in 1969 and 1972. After his retirement Ed Langhart was appointed by the Healdsburg City Council as the City’s first official Historian and Archivist. The Healdsburg Historical Society was founded on January 29, 1976, with Edwin Langhart as its first President. The Healdsburg Museum was installed in a city-owned storefront building on Matheson Street today known as the Healdsburg Senior Center. The Historical Society became a non-profit corporation in 1977 with a volunteer staff for the Museum. Today’s home of the Museum is the beautiful a neo-classical revival structure originally funded by a $10,000 grant from industrialist Andrew Carnegie to build a Carnegie Library. Designed by Petaluma architect Brainerd Jones in 1909 and built by contractor Frank Sullivan of Santa Rosa in 1910-11, it functioned as the town library from 1911 until 1987. When a new building was built for the Healdsburg branch of the Sonoma County Library, the Carnegie Library building was threatened with demolition. Those in the community who wanted it preserved joined forces with the Historical Society which raised over $558,000 (bolstered by a $110,000 matching grant from Mr. and Mrs. Edward H. Gauer) to restore and retrofit it as an elegant new home for the Museum. It opened in May of 1990 and is now listed on the National Register of Historic Places. The Museum was initially known as the Edwin Langhart Museum, but as the name did not adequately convey the Museum’s mission, it was changed to the more descriptive “Healdsburg Museum and Historical Society.” We continue to honor our founder in many ways, including granting the annual Langhart Award to volunteers who have shown the same tradition of volunteerism and dedication to Healdsburg’s history that defined Edwin Langhart. The Museum’s first paid employee was a curator hired in 1995. Today the Museum is managed by its Curator and Executive Director Holly Hoods, supported by Research Curator Lauren Carriere and Office Manager Jane Bonham. The operation of the Museum is dependent upon the labor of over 100 dedicated volunteers and the fundraising efforts of HM&HS.